Wine Ch. 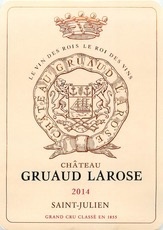 Gruaud Larose 2013 - Royal Wine Merchants - Happy to Offer! Clear. Garnet red. The nose is fresh, subtle combining red fruit, prune à l’eau de vie, dry fig and cocoa. Frank, rich attack, good body with fatness. The tannins are still present but are beginning to mature giving place to roundness and finesse. Beautiful length. Enjoy it now or lay it down.